Walk through of the steps of hiring a Temporary Employee appointment. This knowledgebase document is intended to provide steps to hire a University Staff - Temporary Employee (TE). Most of the hiring process will be similar to other hiring HR Transactions. Differences will be indicated throughout this knowledgebase document. *Note - University Staff - Temporary Employees (TE) were once called Classified - Limited Term Employees (LTE). You can create the temporary appointment transaction whether you know who you are going to hire at the time of creating the transaction. Enter in a seven character UDDS. Can click the ▼ button to narrow search by first three alpha/numeric. Click the Trans Comments button to enter in comments about the position description (PD). These notes can only be viewed by the HR transaction creator, proxies, HR Staff for the employing unit, and OHR staff. The button will be white if there are existing notes. Users can also add comments onto the Comments tab. Enter the title code. Can click the ▼ button to narrow search. Not editable - automatically populated when title code is entered. Auto populates minimum and maximum of the range based on some job title entered. Fields can be adjusted within the approved range (refer to the Title Guidelines and Transitional Titling Documents for more information ). Indicate if maximum should be posted on the employment website - jobs.wisc.edu. Enter the supervisor's last name, first name, title, and email address. Enter the information of employees with similar duties (to add more than one person, click on the more button. Fields are no longer used. This is the HRS appointment ID. Automatically populates. Automatically populates after the screen is completed and saved. PD effective date is the appointment start date for vacancy PD's, and final approval date for other PD types. Automatically populates once the PD is Division approved. The last date a PD is set as the PD of record. Enter in the Working Title. If there is more than one title for the vacancy, the Working Title should be generalized to reflect all titles. Enter in the three-digit funding source for the position. Enter in the one-digit activity code. Click the ▼ button to make a selection. Click the more button if there is more than one funding source and its activity code. Rate range - enter the salary range the position will be hired at. Click▼ and select future conversation, irregular, or seasonal. Review the TE policy by clicking on the button next to the field for more information. Click▼ and select one of the justifications listed for the various sub-categories or select "other" and complete the additional justification field. Use this field to justify "future conversion" TE positions or to justify the selection of "other" for sub-category. Enter in the number of hours the TE is expected or work or the end date of the TE appointment. Enter in the address information where the selected applicant will work. Enter in the contact information of the person who is the point of contact for the TE appointment transaction (defaults to PD creator). Select work scheduled. To enter more than one, click on the more button. Indicate if the position is a Blue Collar multi-shift. Click the ▼ button to make a selection. Click the more button to additional requirements. Enter in additional requirement comments (optional field). Enter a complete URL to a website with information related to the vacancy. Enter in the application deadline date. Indicate if the position should be posted on the web page - jobs.wisc.edu. Indicate whether the position should bypass web posting. Click the ▼ button to make a selection. The is a required field. Enter in additional application requirements (e.g. submission requirements - cover letter, resume or job contact information). This field must match what will be entered in TREMS. Indicate whether the position is under the Wisconsin Caregiver Background Check Law. Is the filling of this GPR/Tuition funded position essential? Select appropriate selection. 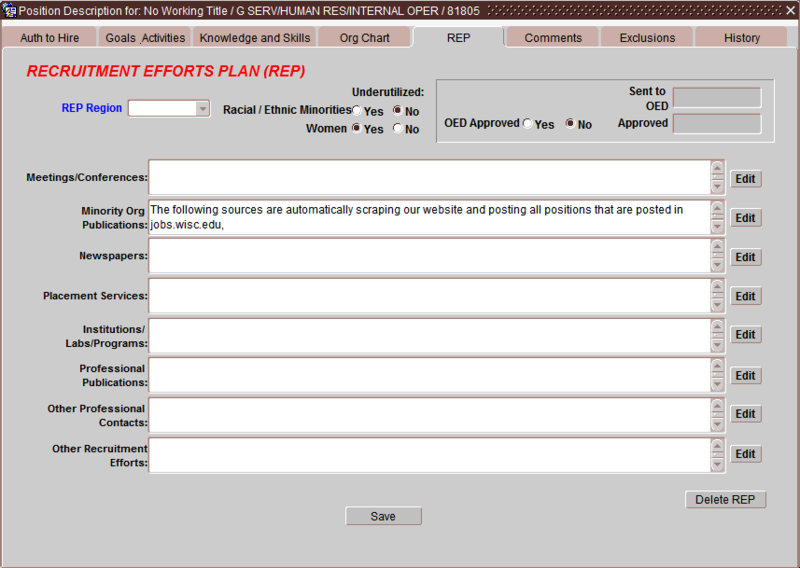 If not GPR funded, no other information needs to be completed on this tab. What type of essential function does this position carry out? Click the ▼ button to make selection. Explain how this position is essential in the above selected category? Enter information on how this position performs essential functions. If you know who you are going to hire at the time of creating the TE appointment and have delegated authority to complete the hiring transaction, you will fill in the TE Detail page. 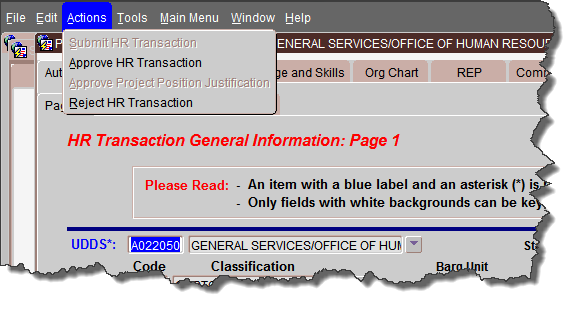 If you do not know who you are going to hire at the time of the transaction, you can skip this page and complete the remainder of the tabs.If you do not know who you are going to hire at the time of creating the TE appointment transaction, you can search for the transaction later and complete the TE detail page and hiring process. Enter in the employees home address (release home address allows the employee to choose whether their home address, home phone, and home email address can be release by the university to vendors and organizations that may wish to mail you information. Select Rehire Post 7-1-2013 elect WRS if the Rehired Annuitant's WRS Termination Date was on or after July 2, 2013 and their position is expected to last one year and require 600 or more hours of service (440 or more hours for teachers and educational support staff) but is not expected to require 1,200 hurs of service (880 hours or more for teachers and educational support staff). Select Rehire Post 7-1-2013 no WRS if the Rehired Annuitant's WRS Termination Date was on or after July 2, 2013 and it is not expected that their position as an employee or contractor will last one year and require 1,200 hours of service (880 or more hours for teachers and educational support staff). Select Rehire Pre 7-2-2013 elect WRS if the Rehired Annuitant's WRS Termination Date was prior to July 2, 2013 and the employee is electing to actively participate in the WRS. Select Rehire Pre 7-2-2013 no WRS if the Rehired Annuitant's WRS Termination Date was prior to July 2, 2013 and the employee is not eligible, at this point, to participate in the WRS OR if the employee does not elect to actively participate in the WRS. Click the box if the employee will be working out of state. Click the box if the employee is a foreign national. Select yes or no (Defaults to no). If yes is selected, enter in justification. Select yes or no (defaults to no). If yes is selected, click on the request overload button. You may need to stop your process until the overload has been approved. Automatically filled in with the Title Code. 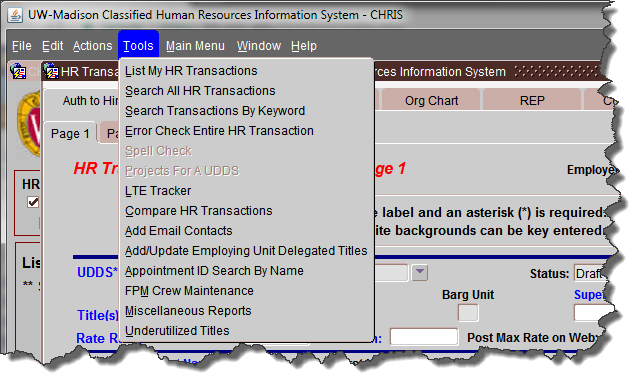 If there is more than one title code entered in the HR Transaction, users can edit or change the Goals and Activities for each job title by clicking on the View Different Title button; a pop-up window will allow the user to select the job title to be reviewed and/or modified. 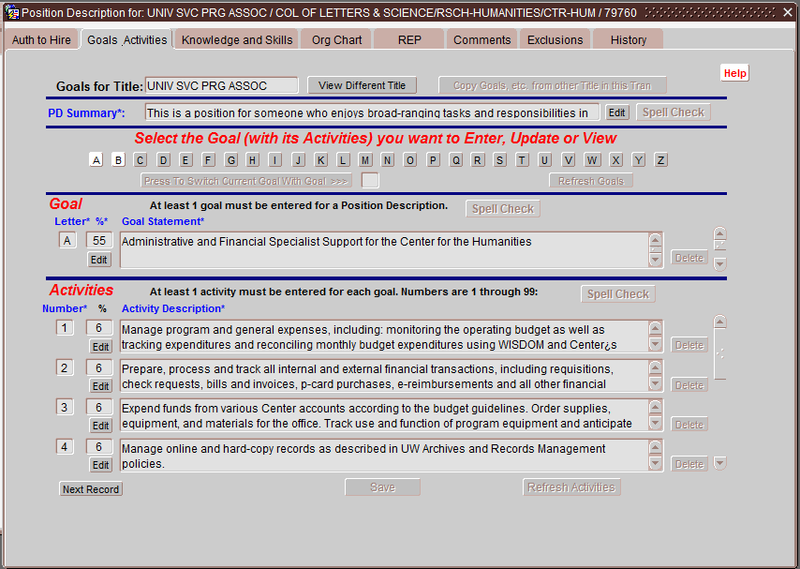 Users can also copy goals and activities from another title in the opened HR Transaction. Enter in the PD summary for the PD. Click the Edit button to open a larger typing area. This is a summary of the position's goals, in addition to information that applies to the entire position (i.e., position in the process flow, formal name and nature of the program, nature of the organization, etc.). This is the summary that shows up on jobs.wisc.edu when an applicant opens a job posting. There are delete buttons that can delete an entire goal and any activities associated. Users can also delete a single activity. Spell check can be used for each section on the goals and activities tab. If copying and pasting from an external resource (e.g., word document), review all punctuation - it sometimes does not paste correctly. There are delete buttons that can delete an entire knowledge or skill associated. a. Name, Title Name, Appt. 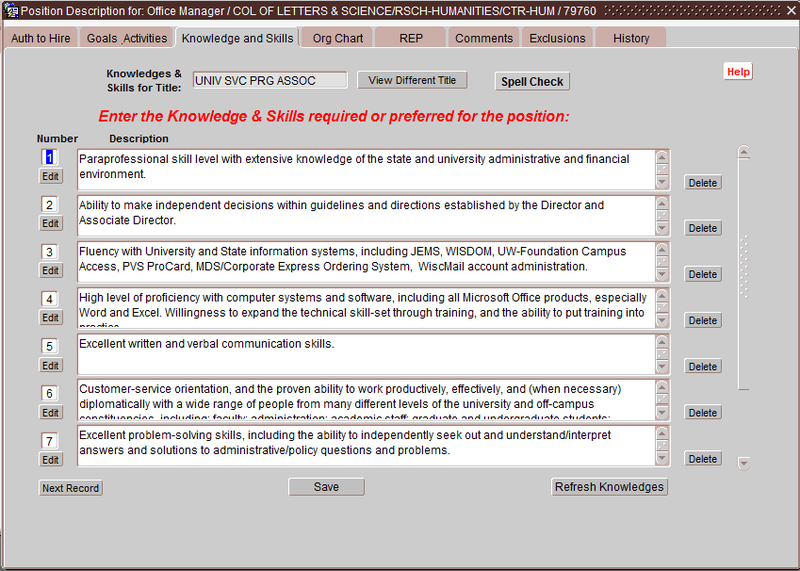 Type are required for each position added into the Org Chart. a. Add a Peer that holds the same position level as vacancy billed filled. Enter in an existing HR Transaction number and click the Copy button. Can highlight a person on the Org Chart and modify the details. If you modify information, it is best to click the SAVE button. Specify the name(s) of newspapers, publications, etc where the recruitment will be advertised. Review the error(s) message (left column). Review the error action needed to clear the error (right column). Click the Go To Error button next to each error to redirect to tab where the correction is needed. 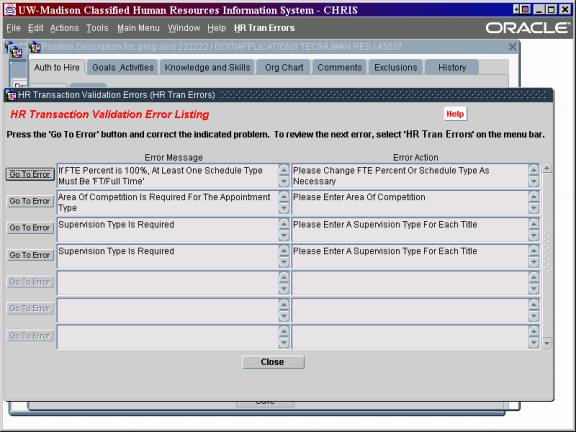 Click HR Trans Errors in the window main menu bar to check for other HR Transaction errors. Upon successful submission, an email notification is sent to the next level HR staff listed in the HR Transaction workflow. If the HR Person reviewing the HR Transaction accepts the PD submission, they can approve it. They can also edits the HR Transaction before they approve it. If the HR person reviewing the HR Transaction feels that a significant amount of changes are needed, they can reject it. The staff at the level below the rejecting authority will again be able to update the data. Those who reject the HR Transaction should email the last person who approved it. The rejection reason is required to be added to the Comments tab. This field is no longer used. It will always be a dull gray text color. If you know who you are going to hire at the time of creating the TE appointment transaction, you will use the following steps to complete the transaction and send the information to HRS. If you do not know who you are going to hire at the time of creating the TE appointment transaction, you can search for the transaction later and complete the TE detail page and hiring process. 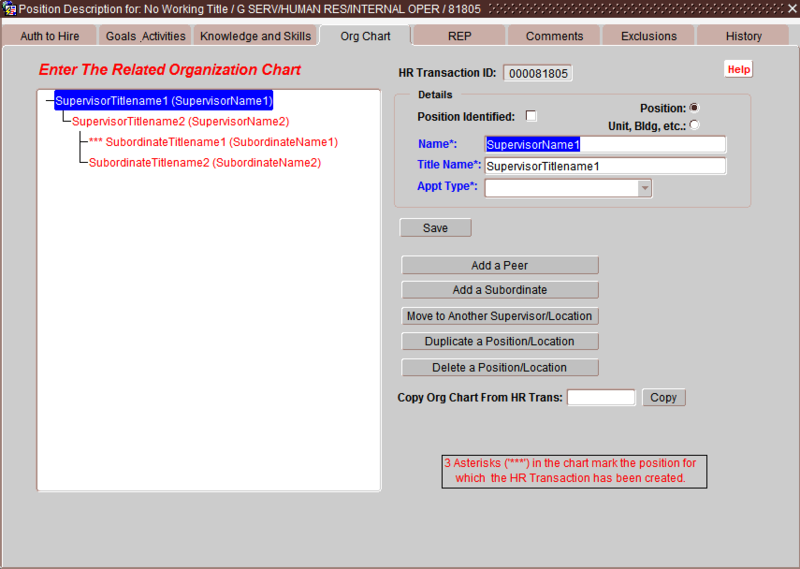 5 If there are no errors in the TE transaction, you can click on the OK button (image below). If there are errors, you must correct them before you can complete the TE transaction.